The Citroën of the hi-fi world – well, sort of – Micromega is a French company that has always done things differently. Sometimes its products are superb, at others not so special, but you’d never call them boring – at least from a design perspective. No surprise perhaps, that it was one of the first to catch on the the renaissance in ‘micro hi-fi’. Aurex pioneered the breed forty years earlier, but at wasn’t until relatively recently that small, high quality separates have become common currency in hi-fi. At its heart is the fact that this is a Class AB design. For the design team this was key; they didn’t think Class D modules sounded good enough for the serious hi-fi applications the MyAmp was supposed to serve. From this everything else followed, including the headache of trying to get decent power out of a very small box. The issue is – as ever – cooling. An ABS plastic case was chosen on cost grounds, so the designers could specify higher quality electronics, but this doesn’t sink heat easily so Micromega had to build in a special, silent running magnetic levitation fan-based forced convection cooling system. The designer claims 30W RMS per channel and twice that into half the load, thanks to a stiff 260W LLC Resonant Mode power supply (claimed to be equivalent to a 250VA transformer with 15,000uF capacitors). Also in the box is an ESS Sabre Hyperstream DAC giving 24/96 via its electrically isolated USB input and 24/192 via optical and coaxial digital inputs, plus aptX Bluetooth. There are three analogue inputs, and these are kept analogue all the way through the signal chain. There’s also a 3.5mm headphone socket, subwoofer output and remote control sockets around the back. The loudspeaker binding posts are big and chunky, while the 256-step volume control with its very fine 0.5dB steps is fiddly via the fascia buttons, but easier by the bundled card remote control. I first heard the MyAmp driving a pair of big Focal Scala v2 Utopia loudspeakers at the 2014 Munich High End Show, and was taken aback by how good it sounded – specifically its surprisingly open and expansive character. 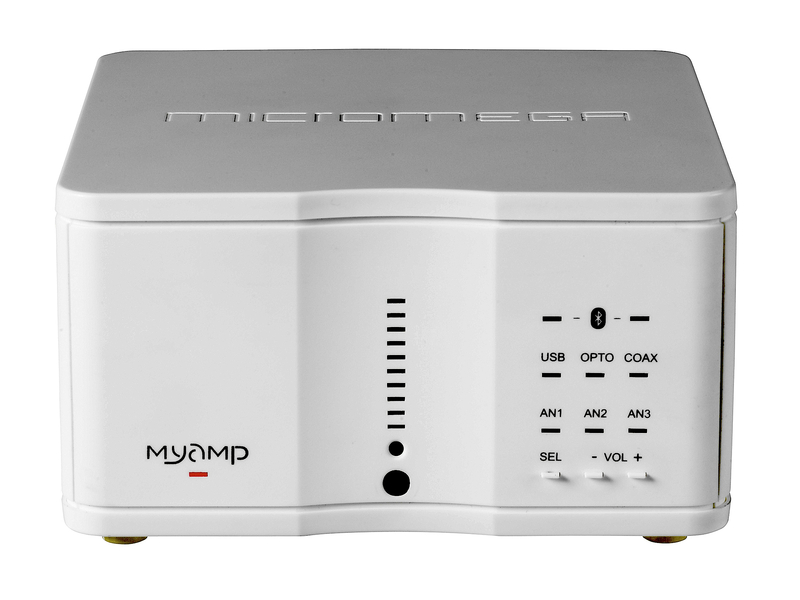 With a detailed midrange and unexpectedly powerful bass, the MyAmp just doesn’t sound like most small amplifiers. Even driving a pair of £7,000 Sonus faber Olympica II loudspeakers in my own system, fed from a £9,000 dCS Debussy DAC, the Micromega was not overwhelmed. Most people however will use it with more sensibly priced ancillaries; my sample spent many happy hours with Cambridge Audio’s superb £900 Aeromax 6 floorstanders, whose 90dB sensitivity proved just enough to let the amp sing. Via the analogue inputs, the little MyAmp is smooth and even, never descending into coarseness, even with thin sounding and forward source material. With smoother stuff it is surprisingly sumptuous and inviting for a product of its price (and size). It bounces along rhythmically and serves up a satisfyingly spacious recorded acoustic. In absolute terms, you can tell there’s a slight softness to the cymbals, and lower down it didn’t quite have the transparency or urge of more expensive amplifiers, but it still has a stab at getting things right. It goes decently loud, but the thermal cut-out tripped on a little earlier than I’d expect, at middling volume levels in a largish listening room. Perhaps it was because Led Zeppelin’s Whole Lotta Love was playing? Hi-res digital via the USB input proved remarkably civilised compared to some rivals at the price; there’s a certain directness and closeness you get from the digital input which the analogue inputs don’t quite have, although a high quality analogue source does sound smoother. The Micromega sounds crisp and musical via its Bluetooth input, but lacks finesse and stereo depth; it’s a great convenience feature but not for serious hi-fi listening, I’d say. Overall, the MyAmp makes music in a really rather enjoyable and charming way, with obvious Gallic flair. If you’re looking for a compact amplifier to make music in your study, bedroom or kitchen, then I can think of few better at the price.